- Model Name parameter removed. It is now the cube. Special thanks to onetwo for his idea and tutorial. Thanks to progammer for doing the footwork and testing on his crap computer. Since mouse tracking is using unit is highlighted events, any big unit (command center, thor) will block and reduce the precision. Either make those unit unselectable/untargetable or scrap the idea. 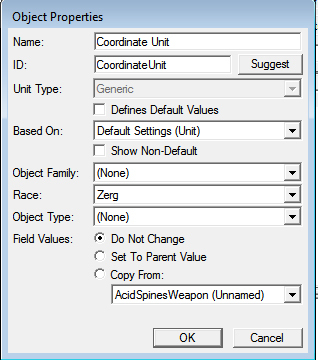 Basically you dont have to do anything with this unit, just note it name down. Player: Initiate player into the tracking system. Note for localization issue: If you does not see the trigger name due to localization, use those above screenshot to rename them. I'm definitely going to have to check this out... I was trying to figure out a way to do this back in April, haha. So, Progammer, Could we use this to track position on Screen and display tooltips, Like we wanted to do before but couldn`t? This is using unit on the field to track, you dont even attempt to know how its done. The UI is weird with all the different resolution and anchor so: No. Well excuse me then. It was just a question, It was also to bump this thread.. It's not very clear to me in the videos, Are clicks required to detect the position? or is the hover position returned immediately when my mouse hovers over it? 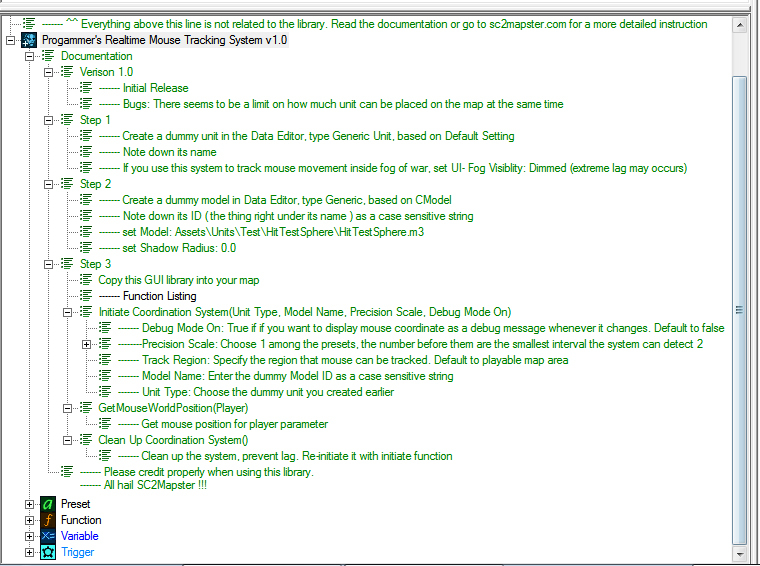 I'm actually working on a mouse tracking system too, but with a distinct method from this one. Unfortunately it's not working out too well right at the moment. I was reluctant to code a tracking system via this method due to concerns that it would perform poorly with lower end pc specs due to the large number of dummy units required, but thats just me. Either ways, good job getting this asset up and running. I'm sure it'll be a useful tool for many modders. If all else fails in my attempt, at least I know theres somewhere to fall back to. Have you tested this in multiplayer? It's a good proof of concept but I'm curious if the performance is tolerable online. This would be awesome if the units could follow a player's viewpoint, instead of spawning on the whole map. also will i get a answer to my question? You think progammer would have made such a ragtag system if there was something like trackables? Dear Jesus I'd kill a newborn for good trackables support! Yea, riiight. RtSC is a mod to Wc3, not a simple map. So first of all you'd need an emulated private battlenet server to actually be able to use such a modified Sc2. Let alone you need a good team for that. Not everyone can tinker such a thing together, you know? Instead of filling the whole map with dummy units do this..... 1. Create a dummy type unit like you already have. 3. Make a ring of 15-20 dummy units around your mouse cursor (or a unit directly under the mouse cursor for initialization) but make sure you calculate how many dummy units you need to make such that there is no gaps in the ring. rememeber circle geometry from high school, lol. 4. whenever your mouse cursor moves out of the ring, it will highlignt one of the dummy units. 5. immediatley move the dummy ring units so that they make a ring around the unit that was highlighted and set the MousePosition variable to the highlighted unit. (before you move it to its new spot obviously) this will serve as mouse movement detection and require no grid of dummy units. Does not work on a 256x256 map, it only fills about 10 colums full of units. Same thing if you use a building. What exactly did you get ? trigger timeout or an unit cap ? Try with lower precision ?